Ano, situace se opakuje. Sehnat kontakt (pokud mozno, tak na nekoho, kdo to opravdu nevidel z rychliku), vynalozit usili ke spojeni, jak s ucitelem, tak k vytvoreni skupiny zajemcu a pak se ucit. "Der Meister des Jiu-Jitsu, der japanischen Selbstverteidigungsmethode, ist in Marienbad eingetroffen und wird hier einen Kurs für diese praktische Methode der Selbstverteidigung eröffnen. Herr Sumakow hat bereits in vielen Städten die Polizeimannschaft in dieser Art ausgebildet." "The master of Jiu-Jitsu, the Japanese method of self defence, arrived in Marienbad (Mariánské Lázně) and will open here a course of this practical method of self defence. Mr. Sumakow already has trained the police squad in many towns in that method." In fact, around that time, Alexander Sumakow appeared in several newspapers of the k. & k. monarchy as a teacher of self defence, holding courses for the police corps of different cities (of Bozen [Bolcano] and Innsbruck, for example, and obviously also of Hungarian cities). As he still sojourned in Hungary when WWI broke out, and therefore as citizen of a hostile nation, he was interned at Esztergom in 1914 as a POW. 2. In another issue, this time from 1910, the "Pilsner Tagblatt" again wrote about a demonstration by Wladimir Kasulakow, another Russian teacher of Jiu Jitsu. About Kasulakow, there exist even more newspaper-articles from different towns and nations, from the time before and after WWI. (Austria-Hungary, Belgium, France and the Netherlands. I own a book from the late 1920ies, written by a police officer of the last country, which shows Kasulakows "W.K.-System", with an older Kasulakow himself demonstrating the techniques. In other notices about him, in addition to "Jiu-Jitsu", the expression "Ju-Do" is also used in brackets. There's also one article, that mentions Kasulakow as "holder of the black belt". The purpose of the aforementioned demonstration was a "certainly very compelling" (as it was written) object-lesson, because there existed an intention, to have him train the police squad, obviously in Pilsen (Plzeň), like he (also) had already done in many cities. Interestingly, and in addition to the police, Kasulakow during that courses often also taught holds to rescue injured or unconscious people from hazard zones to emergency forces and fire-fighters. 3. 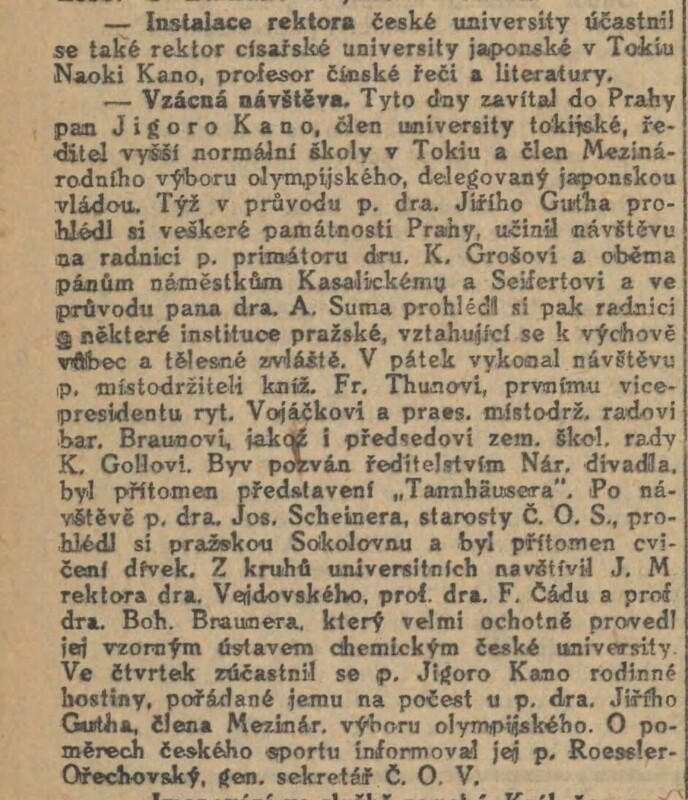 Also in an issue from 1910, the "Teplitz-Schönauer Anzeiger" mentions Kasulakow to have taught the police of Karlsbad (Karlovy Vary) and Fischern (Rybáře), and that a final examination in "Dschiu-Dschitsu" has marked the end of that task. Such kinds of final examinations - often also held before the commanders of police and other local dignitaries - were very typical for such courses held by Kasulakow throughout Europe. 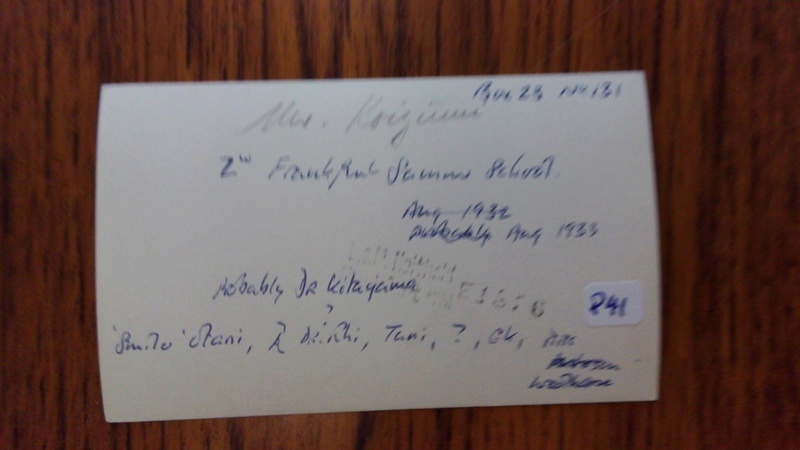 I found any next informations about Mr.Sumakov, Kasulakov etc. It is from Croatian judo/jiujisu history. Među prvim osobama koji su podučavali na našem prostoru bio je Ukrajinac Aleksandar Sumakov, jedan od značajnih učitelja „jiu-jitse”, koji je vježbao pripadnike redarstvenih službi u Hrvatskoj za vrijeme Austro-Ugarske. Aleksandar Sumakov je održao tečaj jiu-jitse u Splitu 1914. godine za redare i članove Hrvatskog Sokola. Nakon njega zabilježeno je da je u Zagrebu jiu-jitsu počeo podučavati Nijemac Ralph Hocke, inače atletski trener zagrebačkog HAŠKa. On je 1920. godine osnovao Zagrebačku školu jiu-jitsua. Uz niz javnih nastupa Hocke je 1924. godine napisao i udžbenik samoobrane pod naslovom „Điu-đicu”. Od 1939. pa do 1941. godine u Zagrebu je živio i radio Oto Baumgarten, rođen 4. lipnja 1913. u Trbovlju, Slovenija. On je bio poznavatelj jiu-jitse, osnovao je sekciju u Sokolskom društvu, a od 1939. godine, živio je u Zagrebu. Na žalost, tijekom 2. svjetskog rata stradava u koncentracijskom logoru zbog svog židovskog podrijetla. Among the first people who are taught to our room was a Ukrainian Alexander Shumakov, one of the major teachers "jiu-jitsu", who is practicing members of the police services in Croatia during the Austro-Hungarian Empire. Alexander Shumakov held a course jiu-jitsu in Split in 1914 for security guards and members of the Croatian Falcon. After it was noted that in Zagreb jiu-jitsu started teaching German Ralph Hocke, or athletic trainer Zagreb Haske. It was founded in 1920, Zagreb School of jiu-jitsu. 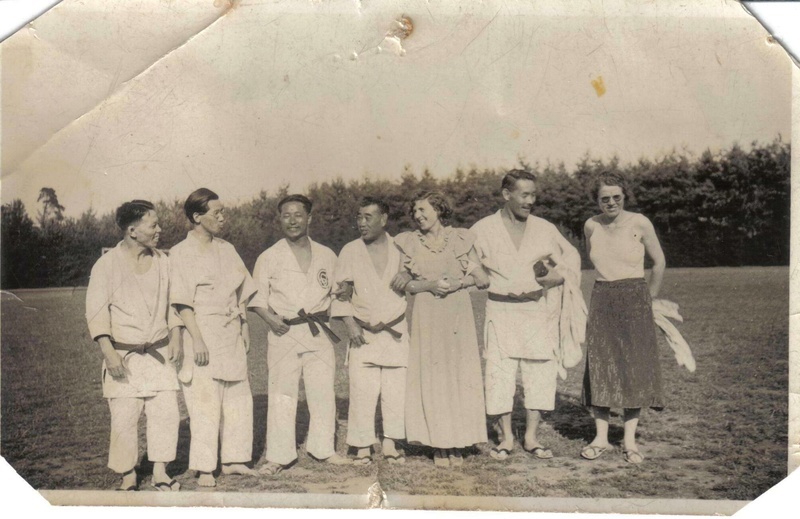 With a series of public appearances Hock in 1924 and wrote a textbook self-defense under the heading "Jiu-Jitsu". From 1939 until 1941 in Zagreb, he lived and worked Otto Baumgarten, born June 4, 1913 in Trbovlje, Slovenia. He was an expert in jiu-jitsu, he founded the section in Sokol society, and since 1939, he lived in Zagreb. Unfortunately, during the 2nd World War II suffers in a concentration camp because of his Jewish origin. Les agents de police terrasseront désormais, sans aucune brutalité et « avec élégance >, les malfaiteurs qui refuseraient de les suivre au, violon ou qui manifestei'a.ient à leur égard des inteuuaos hostiles. Ils vont recevoir, en effet, les précieuses leçons du professeur Wladimir Kasulakov, champion du monde. M. Kasulakov nous a fait, mardi soir, à la salle des mariages, urne démonstration de sa méthode perfectionnée. Son procédé, a-t-ii expliqué, n'a. rien de commun avec le jiu-jitsu japonais toujours dangereux. Laissant de côté les moyens de défense de la race jaune, M. Kasulakov veille surtout à « nerien casser » et à conserver à ses mouvements ie caractère d'élégance et de douceur qui mettront désormais les policiers à l'abri des critiques de la foule. Ce nouveau système, basé sui la pure anatomie, a pour but de réduire à l'impuissance le plus dangereux des malfaiteurs sans causer d'autre torture qu'une douleur passagère. Le principe fondamental réside dans ce proverbe d'ExtTême-Orient qui dit: « Si tu me pousses, je te tue, si tu nie tue, je te pousse ». En d'autres termes, la technique du jiu-jitsu moderne veut qu'on complète les efforts de l'adversaire pour vaincre l'adversaire lui même Et, de fait, le professeur réussit pleinement. Ses démonstrations ont d'ailleurs mis en lumière les importantes qualités de sa méthode et ses avantages incontestables. M. Kasulakov, qui a parcouru les principales villes de France, va demeurer quelque temps à Toulouse pour faire l'éducation de nos agents de police. Lorsque ceux-ci seront complètement instruits et familiarisés avec les « tours » du jiu-jitsu, la police toulousalrue sera dotée d'une nouvelle arme contre les malfaiteurs dangereux qui n'auront qu'à se bien tenir. Police officers now terrasseront without any brutality and "elegantly>, the criminals who refuse to follow the violin or manifestei'a.ient to them hostile inteuuaos. They will receive, in effect, the valuable lessons of Professor Wladimir Kasulakov world champion. Mr. Kasulakov made us Tuesday night at the marriage hall, urn demonstrated his improved method. His method did ii explained, did. nothing in common with the Japanese jujitsu always dangerous. Leaving aside the defense of the yellow race, especially Mr. Kasulakov ensures "nerien break" and keep his movements ie character elegance and softness that now the police will immune to criticism from the crowd . The new system, based sui pure anatomy, aims to reduce to impotence the most dangerous criminals without causing other torture a passing pain. The basic principle is this proverb ExtTême East who said: "If you shoot me, I'll kill you if you deny killing, I push you." In other words, the technique of modern jujitsu wants us to complete the opponent's efforts to defeat the opponent himself And indeed, Professor fully succeeds. His demonstrations have also highlighted the important qualities of his method and its undeniable advantages. Mr. Kasulakov who traveled through the main cities of France, will remain for some time in Toulouse to the education of our police officers. When they will be fully trained and familiar with the "towers" of jiu-jitsu, the toulousalrue Police will have a new weapon against dangerous criminals who need only to hold good. And we no longer hear the jeers in the streets of this public news items that always defends Pulcinella strikes when the policeman and lacks s a little hard to qualify the authority figures each fools that they sketch via gesture a bit brutal, often by necessity i'attituidie offenders. - E.C. Alexander Sumakow also taught in Znaim (Znojmo). This happened in 1913. The matter is interesting, because there are more details available than usual, about this incidents. BTW, some times his name was written "Sumakoff" in that case. At first, the holding of a "Dschiu-Dschitsu-course" by Sumakow for the municipal security guards, lasting for 8-10 days was decided, as well as a honorarium of 300 korunas for the teacher, "if the public, final examination results in satisfaction". Then Sumakow, during the course for the police, one evening also held a public demonstration at the municipal school for boys. As enough participants registered, an additional, ten-day private course was organized. Ahoj, kdyby někoho zajímala historie šíření džúdžucu (jujutsu, jiujitsu, jujitsu) mimo Japonsko, tak níže jsou odkazy na stránky, kde jsou naskenovány dobové novinové články a fotografie tehdejších průkopníků a zápasníků. Yukio Tani, Higashi, Tarro Miyaki, Kano Jigoro, Ono, Yamashita etc. V příspěvkách nahoře je zmíněno působení Wladimíra Kasulakova jako učitele džiudžitsu / jiujitsu / jujutsu / džúdžucu v zemích Rakouska Uherska a později ve Francii. Později ten jeho systém sebeobraný propagoval jako svůj systém. Od jednoho známého mám odkaz na video z jeho výuky v Paříži. Video pochází z roku 1925. Kasulakov během druhé světové války působil v Holandsku a ranní holandští učitelé prý zmiňují, že učil odboj. Kasulakov zemřel 13.října 1945. Na FCB účtu britských historiku džúdó jsme objevil fotku z roku 1933. Jsou na ní zachyceni zřejmě učitelé na letní škole džúdó/džúdžucu ve Frankfurtu nad Mohanem. Zleva: Hanho Rhi (korejec učící džúdó ve Švýcarsku), Kitajáma Džunjú, Masutaro Otani, Jukio Tani (Budokwai Londýn), neznámá žena x , Gundži Koizumi (Budokwai Londýn), neznámá žena y.
Kitajáma od roku 1929 do roku 1936 učil japonštinu a východní kulturu na univerzitě ve Frankfurtu nad Mohanem ( semináře - Básnictví a poezie Japonska, Cvičení interpretace buddhistické filozofie Japonska, Úvod do japonského jazyka ). V tomto městě následně s podporou místních podnikatelů založil malý japonský institut Kjo-šicu, který se stal předchůdcem později založeného lokálního japonsko-německého institutu. Také zde cvičil judo ve skupině kolem Alfréda Rhode v 1. Deutschen Jiu-Jitsu-Club e. V. ( později přejmenovaném na 1. Deutscher Judo-Club e. V. - 1.DJC). Ahoj, našel jsme v dobových Lidových novinach informace o 1.ME v jiujitsu v Dráždanech. Z 04.12.1934 o výsledcích - Cígner 3., Dobo 3. Na základě novinových článků se mi podařilo zjistit, že zakladatel džúdó Džigoró Kanó navštívil Prahu 3x a to v letech (1912, 1920 a 1936). V roce 1935 vůbec nebyl v Evropě, v letech 1934 a 1933 ano, ač v okolních zemích v Rakousku a v Německu, tak v ČSR nebyl. Jeho návštěva v roce 1936 je poměrně známá, cestou domů z OH v Berlíně zřejmě jen při této návštěvě učil džúdó (přednáška a keikó). V jednom z článků z roku 1936 je zmíněno, že Kanó pronesl, že je již v Praze potřetí. Podařilo se dohledat v tisku zmínky o jeho dvou předešlých návštěvách. Postupně se pokusím zveřejnit vše, co jsem vypátral k jednotlivým návštěvám. 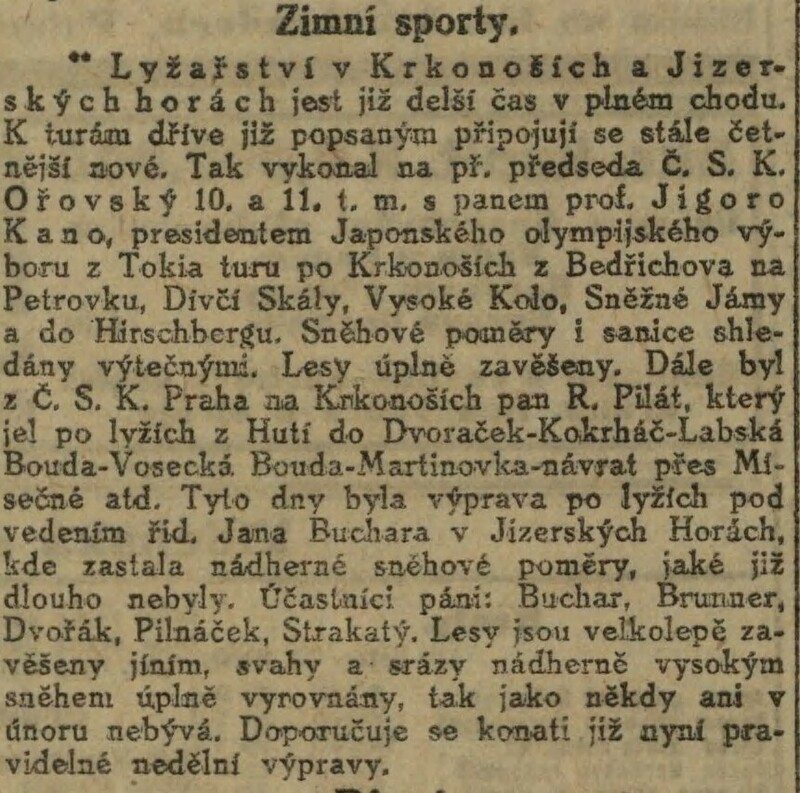 V roce 1912 jel do Stockholmu na jednání a zasedání Mezinárodního olympijského výboru jakožto přezident japonského olympijského výboru, které bylo v červenci. Tam také jezdil z Čech pan Jiří Guth Jarkovský a zřejmě na jeho pozvání Džigoró Kanó dorazil do Prahy v listopadu. O pobytu v Praze z 11.9.1912 článek v Národních listech. Pan Guth jej provedl po Praze, setkali se s představiteli města a navštívil univerzitu a cvičení dívek. 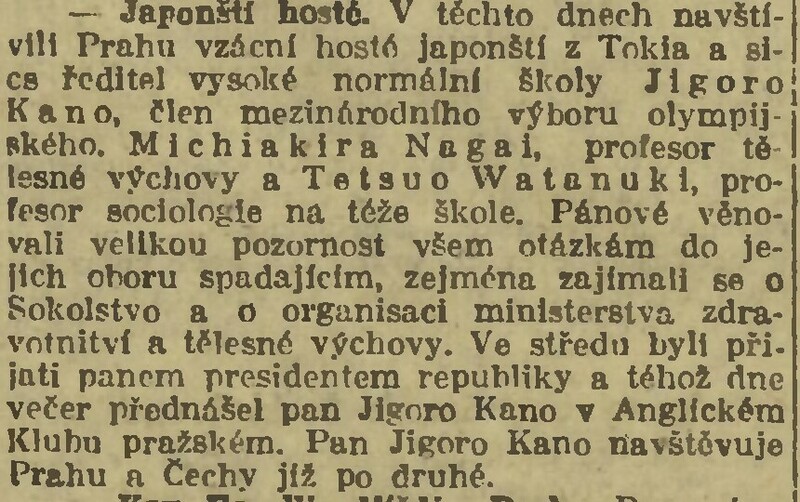 Kanó byl v Japonsku jedním reformátorů školství a i při této návštěvě se zajímal o pedagogiku a tělesnou výchovu. Rok 1920 se konaly Olympijské hry v Antverpách a po té v září Kanó s delegací vysokoškolských pedagogů zavítal také do Československa. Zajímali se o Sokolské hnutí a fungování Ministerstva školství a tělovýchovy. Byli přijati panem prezidentem Masarykem a jeden večer pronesl v Anglickém klubu pražském Kanó přednášku. Téma nevíme. Většinu zajímavých článků jsme dal na web sem. Je to jen prozatimni, kdyby jsi se tim chtel procist. Jsou to zajimave veci. Casem to nejak zpracuju do psaneho povidani o tehle historii - je to od roku 1912, 1920 a hlavne od 1934 do roku 1940, ale i par pozdejsich clanku je tam. Ty obrazky jsou razene podle data uverejneni v novinach - ve jmenu obrazku je datum a zkratka novin, ze kterych to pochazi. po kliknuti na obrazek se ti to zvetsi do citelne podoby. Ukazuje to a potvrzuje mnohé domněnky a i nové skutečnosti.